With all the effort you put into your Instagram account, wouldn’t you love more reach on your content? In this tutorial, I’ll be explaining WHY you should claim your Instagram account on Pinterest and how you can share your Instagram feed in a strategic way on the Pinterest platform using Tailwind! In late 2018, Pinterest made it possible to claim your Instagram, YouTube and Etsy accounts ON Pinterest. Why does this matter? It matters because now you are able to get ‘attribution’ (fancy for credit) for the way your claimed accounts perform on the Pinterest platform! You can increase your visibility (i.e. get more traffic) on Instagram and cross-pollinate your marketing efforts using Pinterest. This works two ways! One, share your own content from Instagram to Pinterest, so that you potentially get repins and clicks through to your Instagram account. Two, when your audience shares your content from Instagram to Pinterest, you get credit for the way your Instagram content performs, therefore, increasing your monthly views, clicks TO your Instagram account and overall health of your Pinterest account. It’s a huge win-win, especially if you are already rocking your Instagram strategy! Get fresh audiences from Pinterest to follow you on Instagram and engage with you there. Claim your accounts on Pinterest (head to settings and be sure you are logged into your Instagram account on either mobile or desktop). 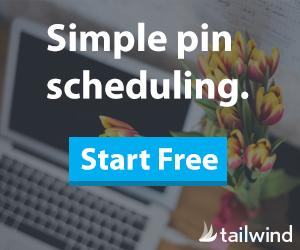 Using Tailwind App, schedule your content from your Instagram account to Pinterest using the Tailwind App interval pinning (the tutorial below shows the whole process!). Want the FULL tutorial? I share a screen recorded video to make the process for you easy peasy below! I’m seeing exciting results following this exact method with client’s accounts! The one major bummer is that while you can see how each Instagram pin performs when you look at your profile, it’s not easy to measure the analytics with the number of clicks on the platform! Hopefully Pinterest will roll out that change in the future? Are you using Pinterest to grow your Instagram presence? Comment below!